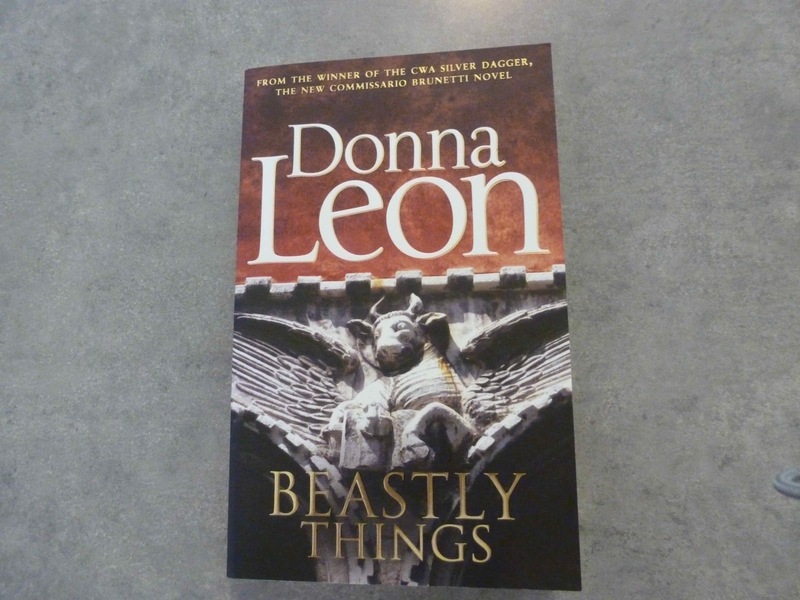 The Little House of Concrete Bookshelves: Donna Leon "Beastly Things"
It has taken twenty-one volumes to do it, but Commissario Brunetti’s son Raffi has (finally) finished school and headed off to University. Apart from that development practically nothing (apart from the emergence of Elettra Zorzi back in Dressed for Death, the third volume in the series) has changed as far as the major characters are concerned since the first episode. 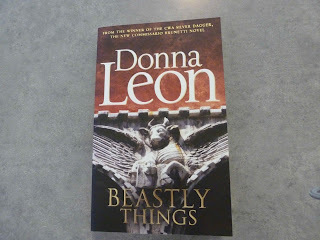 It’s fairly obvious that Donna Leon hit on a winning formula way back in Death at La Fenice and has been able to spin the same elements out every year since. It’s a remarkable achievement. Of course, it helps to have the right setting. Given the endemic corruption in the Italian political system and the wealth of social, political and environmental issues and throw in a healthy dose of ambition, and a heaping helping of greed and you’ve got plenty to work with. Greed drives the wrongdoers, and Brunetti has to tackle cases with thorny implications while steering around Vice-Questore Patta’s determination to look after the well-connected and maintain Venice’s reputation as a Mecca for cashed-up tourists. Brunetti, of course loathes them, detests him, can almost read him like a book and has worked out how to manage him. This time around the investigation is prompted by the discovery of a body in a canal, hardly an unusual starter either, and the corpse isn’t carrying a wallet or anything else that might help to identify him. No one has been reported missing, there no hotel guests unaccounted for, and the face has been damaged while in the water. He is, however, missing a shoe and the one he’s was wearing is rather distinctive. Every little bit helps. A bigger help is a rare, disfiguring disease. Madelung's disease (Benign symmetric lipomatosis) is a condition that results in extensive fat deposits around the head, neck, and shoulders, often related to alcohol abuse, though there’s no sign of it in this case.Given that condition there’s something familiar about the man, and Brunetti realises he’s seen the victim before, at a farmers' protest that was filmed by news camera crews and a look at the video footage delivers an image that Brunetti can use in the investigation. When Brunetti and Vianello set out to canvass the shoe stores they end up in Mestre on the mainland, and learn the victim was a kind man who had a way with animals, and he’s eventually identified as Dottor Andrea Nava, a popular veterinarian whose funeral, described in a moving epilogue, attracts a large congregation that includes nearly as many pets as it does people. epilogue Leon describes the funeral service for an upright, yet all too human, veterinarian where there are as many pets as people in the congregation. Which leaves the question of why someone would want to stab him in the back three times and dump the body in a canal. He might be estranged from his wife but she faints when Brunetti and Vianello, break the news to her. Guilt or grief? His assistant at his veterinary practice, can shed no light on his death although she reveals he was working moonlighting as a part-time meat inspector at a local abattoir. That’s the environment that resulted in the dalliance with Director Alessandro Papetti’s personal assistant Giulia Borelli, though that doesn’t seem to provide a motive for murder. A tour of the slaughterhouse brings Brunetti and Vianello up against the realities of the meat industry that made vegetarians of his colleague Vianello and his daughter Chiara. That particular sequence is a gruesome read though the experience isn’t enough to turn Brunetti into a vegetarian. It does, however, shape dinner conversations in the Brunetti household and interactions with Vianello and Signorina Elettra at the Questura. If you’re not inclined towards the gory details you won’t miss anything by skipping over that section. Outside the ethical issues associated with slaughterhouses there are the usual elements running alongside the main investigation. Signorina Elettra, as usual, manages to hack into the computer system of whatever Italian institution or government department and Vianello is starting to pick up the same skills but has a way to go to catch the Signorina. Brunetti’s conscience isn’t entirely happy about this, but he’s not going to forego the useful info, is he? The investigation meanders along clearly and logically, with everything falling neatly into place in the end and discussions about marital fidelity and the risks therein (Vianello reckons he’d be shot, and Brunetti would either be pushed off the balcony or a rapid transferred to a Mafia infested town in the South), Italian losses in the First World War (Raffi’s studying modern history at the University) and the relative strengths of various players’ social connections. There’s nothing there that’s new, and Beastly Things is of a piece with everything that has gone before. Number Twenty-two, The Golden Egg, is due in April. The preorder is already in.